When Jacob arrived at Canaan, he sent messenger to his brother Esau. Jacob’s messenger returned with the message to Jacob that Esau is coming to meet him with four hundred men. Jacob was very afraid that Esau will attack him with his four hundred men. So he separated his men and livestock into two groups because he thinks if Esau attacks one company, the other company can escape. Jacob prayed to God that he will be delivered from his brother Esau. Then Jacob sent 200 female goats, 20 male goats, 200 ewes, and 20 rams, 30 milk camels with their colts, 40 cows, 10 bulls, 20 female donkeys, and 10 foals through his servants to Esau. At night, Jacob woke up and took his 2 wives, 11 sons and crossed the Jabbok River. Then he went back to the other side of the river. The next morning, Jacob saw Esau coming with his 400 men. Jacob put his maidservants in front, then Leah and her sons, and finally Rachel and her sons. Jacob made them bow down before Esau. First, the two maidservants and their sons come and bow down. Then Leah and his sons bow down before Esau. Finally Rachel and her sons also bow down. Esau said, “I already have plenty of them. Take them for yourself.” But Jacob insisted that Esau receive the animal livestock as present from him so Esau accepted them. 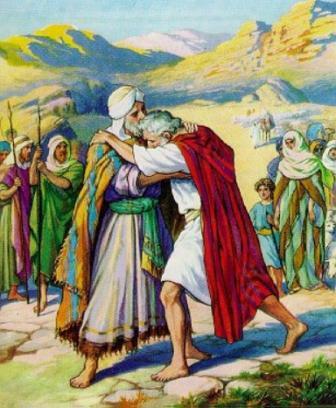 Esau wanted to accompany Jacob on the journey. Jacob refused the request because his children are still young and unable to travel fast. So Esau went back home to Seir. Jacob made his way to Succoth and built himself a house at that place. He also made shelters for his livestock.